Isshin is a small sushi bar in Asakusa, located a 12-minute walk from Asakusa Station (Asakusa Line, Ginza Line). Even though the restaurant boasts a Michelin star, the place is rather unpretentious. The place is equipped with only a 10-seat L-shaped counter and the decor is simple. What you can enjoy is some amazing Edo-style sushi. The toppings are, of course, super fresh. If you ask for the omakase (leave it to the chef) course, you can be sure that you will be treated to the best seasonal ingredients. Locals like to have the omakase course that includes "otsumami" (small side dishes). The otsumami plates include "chawanmushi" (savoury　egg custard) and some grilled fish for instance. 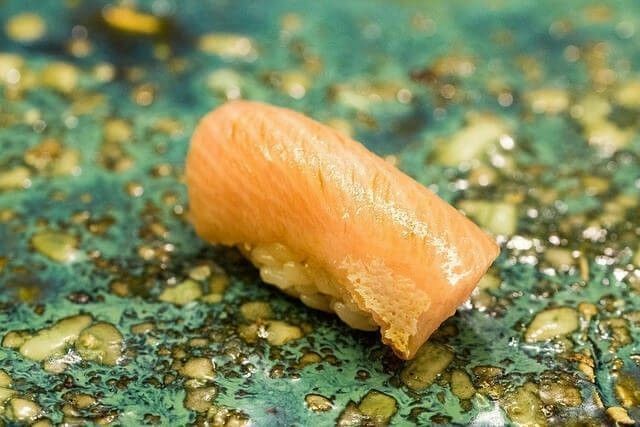 After the otsumami are served, you will enjoy some incredibly delicious nigiri sushi that have a unique 'shari' (sushi rice). The rice is cooked over a charcoal fire, for one thing, and the finished product is said to be more moist than average. Also, the chef likes for the shari to have a relatively strong taste so more red vinegar is added and a little bit more salt than average. Red vinegar is a key characteritic of Edo-style sushi. You will see that the rice is actually a little red too. The strong-tasting shari and the fresh toppings blend together wonderfully well, making this place one of the most reputable addresses for sushi among connoisseurs in the city. Halal Sushi In Asakusa, Tokyo At Asakusa Sushi Ken!